My 17 month old son’s teeth have brown spots on them that 2 different dentists have told me is a weakness in the enamel that formed when I was pregnant. His front teeth now have chipped and it looks like the chipped part is getting worse or more worn. We’ve been using Xylitol paste, gel and for the past 2 months we’ve been putting small drops of a fluoride toothpaste on his toothbrush. I’m worried that the tooth enamel being weak may be due to other health issues, possibly allergies (although he doesn’t seem to be allergic to anything). How can I best preserve his teeth and ensure that his adult ones come in without defects? I’ve read your blog suggestions for children’s health. Is there anything you recommend nutritionally? He has never had juice or sweets and does have cheese and yogurt most every day. He still nurses and insists on nursing at night. How bad is night nursing? I’ve tried to stop it, but he cries so much, I end up giving in! 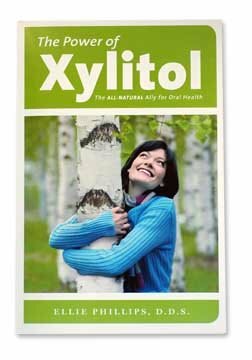 Xylitol can change the bacteria in the mouth they will become healthy and protective. Xylitol can help mineralize and build strength into teeth. In the case of your family, I would recommend that you all work to improve the health of your mouths. Unhealthy tooth bacteria can be transferred from person to person, so I would suggest the whole family is involved in this process. This means working to have some xylitol regularly. Wipe some on your baby’s teeth (Spiffies are a good option) or give your son a little drink of water with some xylitol from time to time throughout the day. A baby who naps with his mouth open can “grow” acid-forming bacteria. Xylitol will help rid the mouth of aggressive bacteria and replace them with a tooth protective shield. You do not mention the kind of “fluoride” toothpaste you are using. I would prefer to see you use either a tiny dot of Crest Original or a drop of ACT bubblegum fluoride rinse on the brush. The kind of paste is very important since the type of fluoride in the paste may be different and the abrasiveness of even “health-food pastes” can be harsh for teeth. The adults in the family may like to consume xylitol mints and gum (like Zellies) better than using granular xylitol. I would suggest you consider the Complete Mouth Care System for the adults in the family. There really is nothing more you can do. You will be gradually and safely eliminating harmful germs from your mouths and trying to build healthy and strong teeth with the combination of ACT and xylitol. Only other thing is to make sure that you are using clean toothbrush always. Remember that brushes pick up bad germs from all over the place especially toilet areas and it is important to clean toothbrushes daily in a little Listerine,rinse off and store dry in a “safe” place. Once you have done all this you should not worry that night nursing will pose any threat to your child’s teeth. Without harmful bacteria in his mouth the sugar and carbohydrate in breast milk cannot harm teeth. These sugars are only dangerous when they feed harmful acid-producing bacteria on teeth. Harmful bacteria use sugars for energy and make acids which damage the tooth surface. Get rid of acid-producing bacteria and you eradicate the problem. The milk will no longer harm your son’s teeth. It takes about a month to rid the teeth of harmful bacteria. Good luck I am sure this will make a big difference to the strength of your son’s teeth. The color may not be regained but that is really only a cosmetic issue. You can consider having this color fixed if it bothers you or your son. Given time, I have seen some of these grooves heal up with the combination of fluoride (ACT) and xylitol used regularly as described. You could ask your dentist if he would paint a fluoride varnish on these soft teeth along the grooves Fluoride varnish is a good product, combined with xylitol in the diet, as described. This varnish wears off gradually and usually provides a steady flow of good fluoride to the teeth for about three to six months…just long enough to protect them while the xylitol kicks into high gear!